Applies to: ONTRAPORT Plus and above accounts. ONTRAPORT provides excellent options for Importing Contacts yourself, but some information cannot be imported or exported through your Administration login. To meet our client's needs, our Concierge Services Team provides custom import and export services, called Custom Import Services. This allows import or export of the items below. Check with us for other import or export requirements. Secure transmission of username, password or SFTP credentials is covered in the PGP Public Key Block section. Note: By submitting this request you are agreeing to be billed in 1 hour increments. Our QA team will estimate the time it will take to complete the task, along with an estimated date of completion (plus or minus one business day). If you approve you will then be charged 50% of the total estimate up front. Once the work has been completed, we will collect the remaining balance and notify you that your request has been fulfilled. You can have ONTRAPORT import your existing purchase history information into the Contact Record. 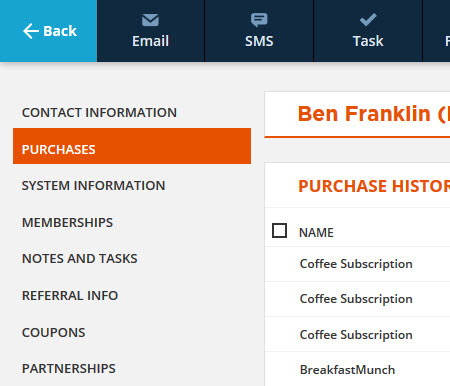 Automation in ONTRAPORT can consider the purchase history for segmenting your Contacts into Groups, or for actions in Campaigns. Any fields not provided will be left blank. The ONTRAPORT Contact ID number can be substituted for the Email address in the CSV file, if desired. The Order Date can be a full linux date and time stamp or a date and generic time such as "01/01/2019 12:00". We cannot import data with more than 50,000 individual products. Q. Can I import negative amounts into purchase history? Q. Do products need to be entered prior to the import of purchase history? A. No, we can add products during the import process. Make sure that your product name is uniform throughout the CSV file. Product names are case sensitive, so "Gold Membership" and "GOLD Membership" would be separate products after import. Q. Can I import multiple prices for the same product name? List the purchase history sorted by Product name, with the secondary sort on the price field (in descending order) as shown. In the example, "Silver Membership" is sold at "99", "49" and "29". Q. Can the CSV file have billing address info on it and will it be imported? A. Yes, you can have a separate billing address in the import file. The same fees and processes apply to exporting the data. Importing credit card information requires PCI compliant processes. Credit cards imported this way can continue to be used for recurring payments without having your customers re-enter their credit card details if you have also imported "open orders" (see below). Note: There are strict regulations for transferring credit card data, and it must be from one PCI compliant processor to another. We cannot accept credit card data directly from individuals or businesses that are not PCI compliant processors. If you have credit card information on file, please contact concierge@ontraport so we can determine the best method for importing. Please do not send any credit card data to us. Obtain contact information from the current PCI compliant processor holding the card data. This will be the person they designate to work with ONTRAPORT to transfer the information securely. Advise them that you have asked ONTRAPORT to transfer the credit card data. In most cases, they will have a "ticket" or "issue number" assigned for the upcoming transfer. Contact our Concierge Team at concierge@ontraport.com with the contact information and ticket or issue number. ONTRAPORT will work directly with your current PCI compliant processor to transfer the credit card data. Q. Can I just send you an Excel or CSV file with the credit card data? A. No. We will not accept credit card data in any format from any person or company that is not PCI compliant. It will be discarded. Please be aware that sending credit card data in an un-secure manner may be considered a data breach and expose you to legal liability. Q. If someone imports credit card data only, what can they do with this info? Is it just manual transactions? A. Imported credit cards act just like other credit cards in ONTRAPORT, allowing you to process manual transactions and continue with subscription or payment plan payments. Q. Do I have to have billing addresses imported along with the credit card information or can I just import credit card information? If we do import billing address, will it just populate in our Address fields or custom fields they create? Since the Address field is technically the shipping address, by default, how does this affect billing if at all? A. We do need the billing address imported with the credit card information. The billing address for each credit card is separate from the contact's regular address fields. Q. What if my contacts have multiple credit card numbers they use for my different products? Can you store multiple credit card numbers for a single contact in OP? A. We can store multiple credit card numbers. You will need to identify the credit card used for each open order for it to be applied properly. The last four digits of the card and the expiration date are used for matching credit cards to specific orders when importing Open Orders (see below). Note: The same fees and processes apply to exporting the data. We can export only to a PCI compliant processor, and cannot supply credit card data to our clients directly. We will provide a contact name, and a ticket number, for the other processor to contact us with the request. A product sold with a payment plan or ongoing subscription generates "Open Orders" in ONTRAPORT that are processed when scheduled. You can have Open Orders imported after importing credit card information, allowing you to move your payment plans or subscription orders to ONTRAPORT. You should also configure your payment gateways prior to import so we can assign the order to a payment gateway. Q. Can I enter a new transaction date for a subscription product in order to edit the recurring payment date? A. Sometimes our customers want to enter a new transaction for a subscription product and want to be able to edit the date their payment goes through so they keep the same billing date. Example case: Joe has a billing date of 1/18 in your old system and you charge him $50 per month recurring. You want to add that product into ONTRAPORT and not have Joe get charged until January 18th. If that's so, then you would want to create a product with a $0 trial for the first month. And then enter the monthly subscription price as normal. From there you can follow the instructions listed below. You see the 'game' is to get the product attributed to the contact record without charging them first. Once you've manually entered the order, follow the steps below to manually update their next billing date. List the open orders sorted by Product name, with the secondary sort on the price field (in descending order) as shown. In the example, "Silver Membership" is sold at "99", "49" and "29". Q. At what time are open orders processed? A. All open orders run at on the date listed in the contact record at 1 A.M., Pacific Time. If you live in Australia and want to set your Open Order Date to fire on January 2, you'll want to set your Open Order Date to January 1 since it runs on Pacific Time. Q. Can you only import Open Orders when Credit Card information is also imported? Is there any way or reason why we would import Open Orders alone? A. You don’t need a credit card import as long as there's a credit card in the Contact Record. Also, you’ll need to let us know what payment gateway should be on the Open Order. Q. What does creating Open Orders in ONTRAPORT from Paypal entail? A. We cannot re-create open orders and subscriptions for PayPal. Note: The same fees and processes apply to exporting the data. In ONTRAPORT, the Notes section can have notes submitted by the contact on a form, or by you or your team member from within ONTRAPORT. This is the data from an affiliate program from your former system. In ONTRAPORT, the affiliate program is called the Partner Program. You can have more than one Partner Program in ONTRAPORT, but an individual Partner can only belong to one Partner Program. Create the Partner Programs you need in ONTRAPORT first. During configuration you will decide if commissions are paid to the "First Referrer" or "Last Referrer". If you pay by "First Referrer" then the first Partner Program link a person clicks determines which Partner gets credit for the sale. This is often used to generate more leads and contacts, as Partners know they can "lock in sales forever" by getting prospects to opt in. If you pay by "Last Referrer" then the most recent Partner Program link determines who gets commission. "Last Referrer" is often used when closing the sale is more important than building the contact list, as Partners will work harder with every contact. Importing the affiliate or partner referral data allows you to keep the proper affiliate tied to the Contact Record for future sales and commissions. For example, if I want to add Colton as my first referrer and Pin as my last, the file needs the following: My contact ID, Colton's contact ID, Pin's contact ID. Our PGP key is below. You can use this public PGP key to encrypt your communications with ONTRAPORT. We encourage the use of encryption when communicating login and password information to secure accounts, for SFTP use if ONTRAPORT needs to access your server, etc. Numerous resources exist for encrypting and decrypting PGP; a good place to start is the Gnu Privacy Guard (GnuPG) Project and their instructions on how to import a public key.